LOVE! 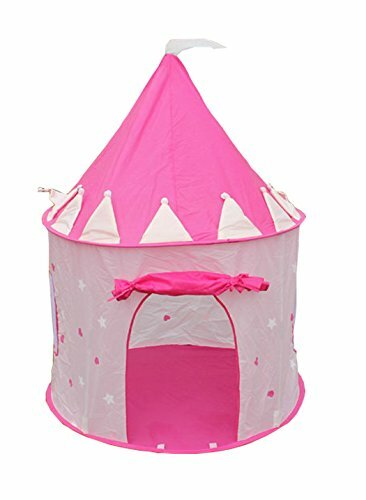 Kids Indoor/Outdoor Play Princess Castle Tent - $15.99! LOVE! Kids Indoor/Outdoor Play Princess Castle Tent – $15.99! FinerKids Pink Princess Castle Pop-up Play Tent, Large Indoor-Outdoor Playhouse Castle. Perfect for Girls 2, 3, 4 up. HOURS OF FUN. Easy-up House, Handy Carry Case, Stakes. PROMISED to Keep ‘em Busy!! HOURS OF FUN - Imagine the JOY & LAUGHTER from your new Princess Play Castle. FREE YOURSELF to Enjoy some SELF TIME. By Far the MOST FUN for the Money of any Toy. Great for INDOOR / OUTDOOR Adventures. GUARANTEED to be their FAVORITE or MONEY BACK!! EASY SETUP, FOLD DOWN & STORE - Can't Wait to Start the FUN? Your Child's FAIRY TALE DREAM Starts in 2 MINUTES. SIMPLE STOW AWAY Too. Folds to Compact 17 Inch, PORTABLE & PRACTICAL Carry Case. Simple to Take to BACKYARD, PARK or on a PLAY DATE! SPACIOUS INTERIOR - Are You Ready for the IMAGINARY KINGDOM to Come to Life?? Large Size, 42" Wide X 54" High. Perfect for Queen's Tea Party or Just a PRIVATE, SAFE Place to RELAX and Play. DRESS UP, Role Play. Foster IMAGINATION and CREATIVITY. SAFE & SECURE - Want to Know WHERE YOUR CHILDREN ARE? Your Kids WON'T LEAVE their New Inside-Outside Castle Tent! It's their Own PRIVATE SPACE!! Premium HEAVY DUTY Nylon Materials and QUALITY Workmanship. DURABLE Stain Resistant Floor and Walls. UNCONDITIONAL LIFETIME GUARANTEE! If Not Convinced Our Indoor-Outdoor Boys & Girls Tents are FINEST Available, Return for NO-QUESTIONS-ASKED, 100% MONEY BACK. Our Pop-up Tents are 100% INSPECTED, Backed by US Team 602-396-2800. Order Now RISK FREE!! FINERKIDS PRINCESS PLAY TENT - START THE ENJOYMENT NOW!